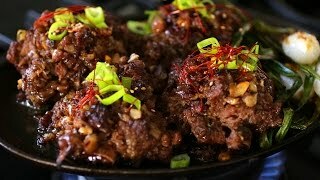 Tteokgalbi is a delicious Korean dish made from beef ribs, where the meat is minced and pounded on the bone, then marinated in a sweet, salty, and savory sauce, and then grilled or barbecued over charcoal. It’s sweet, chewy, and juicy, and best of all, it’s very tender because the meat is already chopped into small pieces and softened. “Galbi” means ribs in Korean, and “tteok” means rice cake, and it was given this name because the process of cutting, marinating, and shaping the meat is similar to the process of making a rice cake. The final dish is also soft and tender, much like a rice cake in texture. And unlike galbi, which tends to be the center of a meal, tteokgalbi is always served as a side dish for rice, along with many other side dishes. Most people eat 1 or 2 ribs per meal, not a whole rack, but if you want to eat more than 4 ribs, who would stop you? The dish originated from Damyang, Korea, which is in the province of South Jeolla and close to where I used to live in Korea. My favorite tteokgalbi place in Damyang was right on the highway running into town, and it was always full of people, smoky, and irresistible. They used foldable barbecue grills and traditional Korean cylindrical briquettes, and their tteokgalbi was delicious! Across Korea you will find many different versions of this dish. To cut costs some restaurants mix in soybean paste or ground pork. 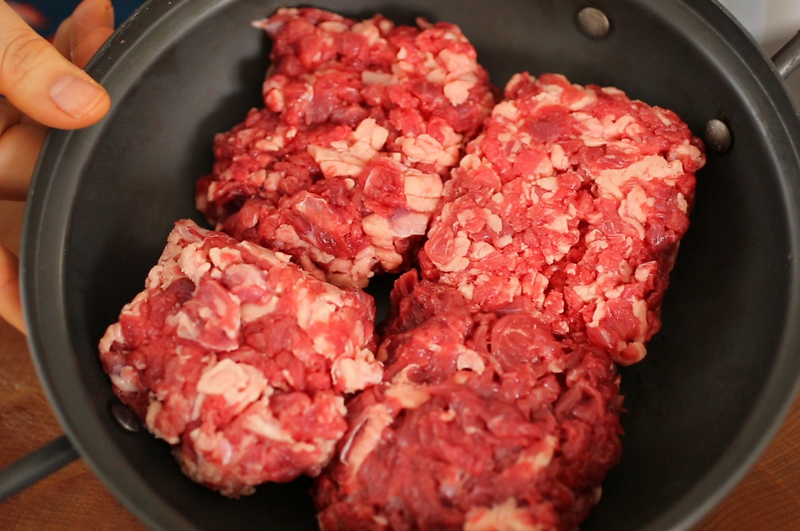 Most places cut the meat off the bone completely, mince it, mix in filler, marinate, and then reshape a handful of the meat back onto the bone, mostly for presentation. The result looks like ground beef with a bone stuck in it. My method is a lot different: I use beef ribs and I mince on the bone. My knife is dancing on the bone! : ) I think it looks and tastes a lot better. I prepare one or two per person, and serve with many delicious side dishes. For best results, slowly grill over charcoal. 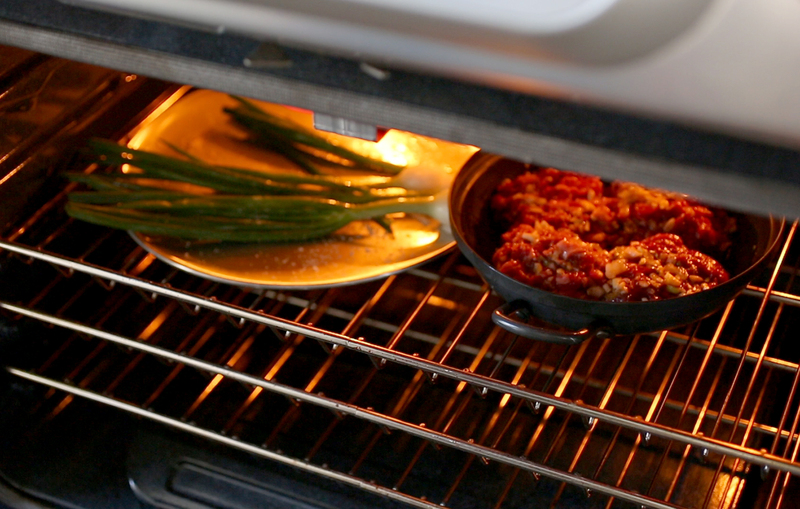 But if you can’t do that, you can use your oven broiler and stove top, like I do in this video. It will still turn out delicious and beautiful. You can double or triple my recipe, but you need to choose meaty ribs, or the result will be a bit meager. When you buy beef short ribs, take a good look and choose ribs with a good shape and lots of meat on them. 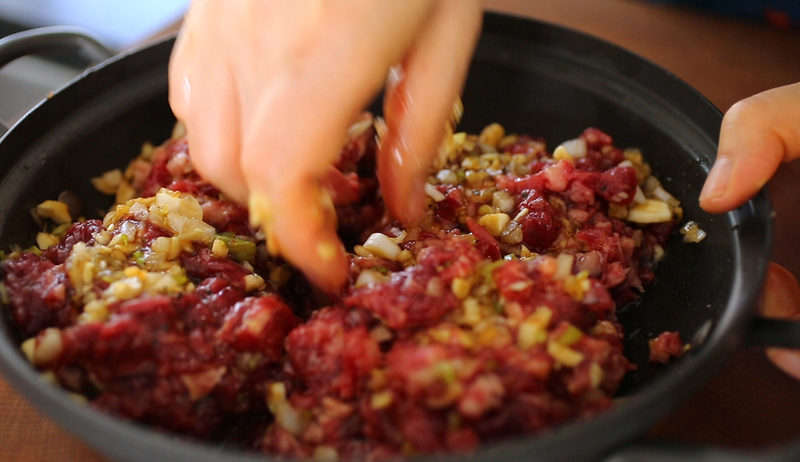 When you’re mincing the meat, you can also take a bit of meat off one and put it on another that needs it, so keep that in mind, too. And if you make a large quantity and use the broiler method that I do in the video, make sure your grill pan is oven-safe and that you pour out the excess melted fat before you cook on the stovetop. Nobody would want to eat melted fat. 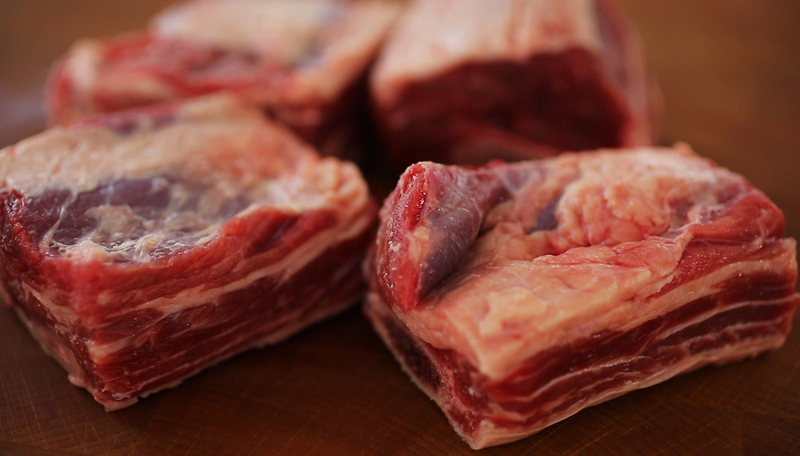 Rinse the beef ribs in cold water to remove any blood or bone fragments. Strain and pat dry with paper towels. Place the ribs on the cutting board, bone side down. 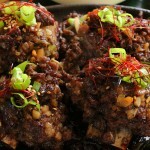 Take a sharp kitchen knife and cut the meat on each rib into small pieces, scoring, pounding with the knife and mincing. Try to keep as much meat attached to the bone as you can. Anything that comes off, put back on the bone as you mince. Shape the meat on the bone into a rectangle, bone down. Place the ribs into an oven safe pan or grill. Combine soy sauce, mirim (or water), garlic, onion, rice syrup, honey, and sesame oil in a bowl. Chop up the light green part of a green onion (keep the green part for a garnish later), add it to the bowl, and mix well. Spoon some onions and garlic from the sauce and massage it into each rib. Mix it in well with your fingers so it marinates. 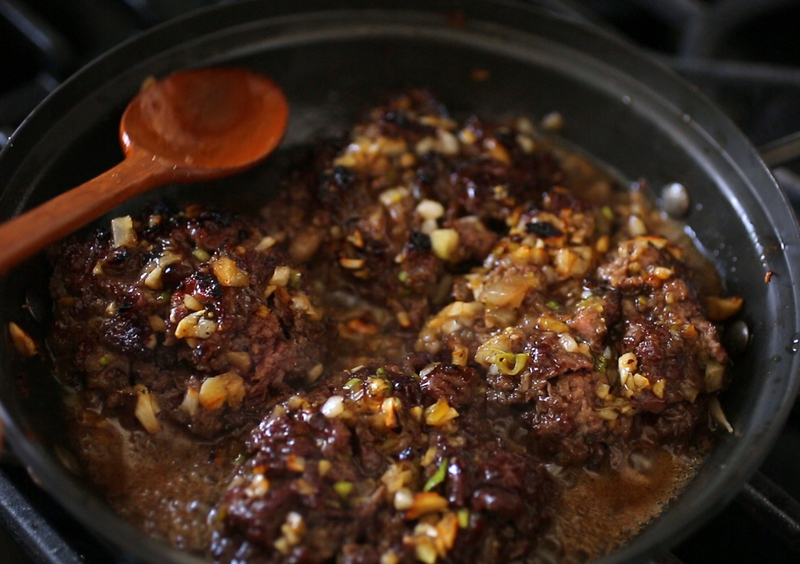 Keep some of the liquid of the sauce for later, but use all the garlic and onions in it. 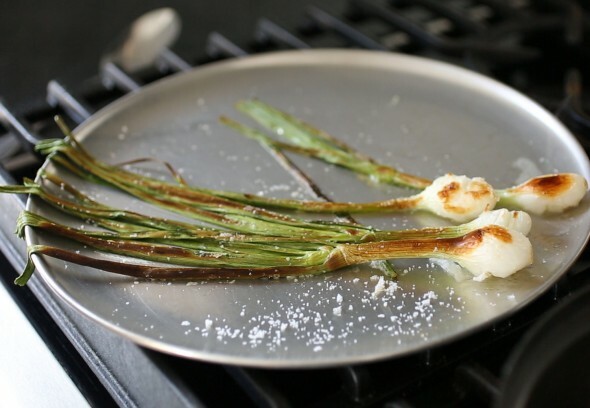 If you like to grill green onions, mix them with a few drops of vegetable oil and a pinch of salt. Place them in a pan. Preheat the oven, setting to broiler for 5 minutes. Place the tteokgalbi and green onion in the oven. Cook for 10 minutes. Remove them from the oven and pour out the rendered fat and oil. Add the rest of the sauce and cook for a few minutes over high heat, scooping the sauce on the bottom overtop of the tteokgalbi. Turn it over and cook for a few more minutes until thoroughly cooked. 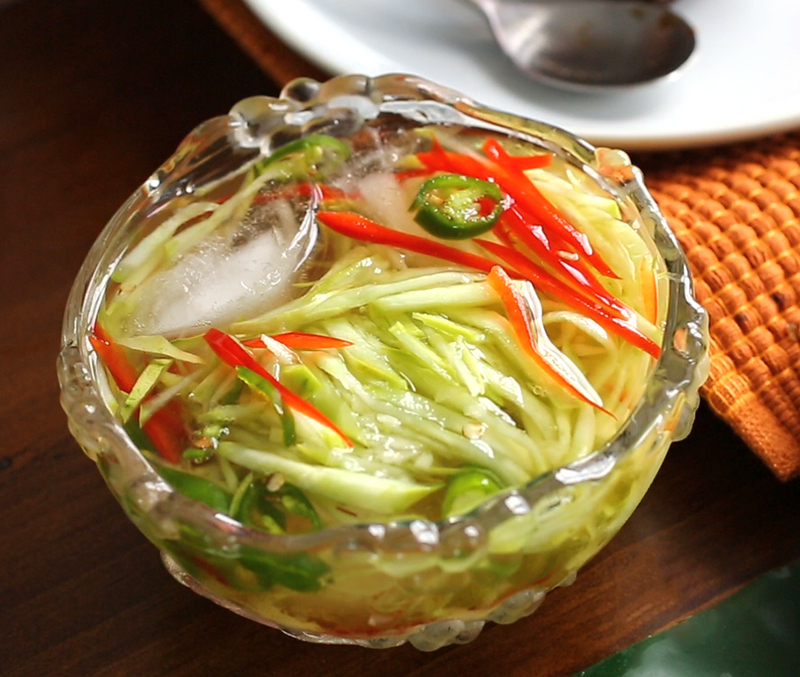 Garnish with chopped green onion, sesame seeds, and shredded red pepper. Serve right away. Posted on Tuesday, August 19th, 2014 at 8:47 pm. Last updated on June 23, 2017. Posted July 28th, 2015 at 8:34 am | Log in to reply. Maangchi, what kind of pan did you use to put the tteokgalbi in to broil? Posted July 28th, 2015 at 9:56 am | Log in to reply. You can get it at any kitchenware store. It’s just a little cast iron pan. Posted September 22nd, 2014 at 6:48 pm | Log in to reply. You are the best chef! Thank you soo much! Come to CALIFORNIA! Posted August 24th, 2014 at 8:40 pm | Log in to reply. OMG, this looks so good. Makes my mouth water!!! Love the touch of grilled green onions to go with it too. Thanks for another great recipe, Maangchi! Can’t wait to try this. Posted August 22nd, 2014 at 2:42 pm | Log in to reply. Also I have a question about iljeolmi… Can I use soy flour instead of soybean powder? it’s almost impossible to find powder in Spain, even in internet :( But maybe the taste or texture is not the same? Can you help me? Posted August 20th, 2014 at 11:52 am | Log in to reply. Posted August 20th, 2014 at 6:36 pm | Log in to reply. No, it’s a really good question! Korean restaurants use foldable barbecue grills where the ribs are placed between the grills. When one side of the meat is a little cooked, they turn over the grill so that the other side of meat will be cooked. They keep turning over the grill and cook slowly. Look for non-stick broiler basket or hamburger broiler on amazon, I think they will work well. Put the ribs inside the basket broiler and cook one side a little, and then turn it over and cook the other side. It’s most delicious when it’s cooked over charcoal and the fat drips off. Or use cooking foil: make some holes in the foil with a fork, put it on your barbecue grill and cook your tteokgalbi on it. When one side is done, turn the ribs over with a spatula and cook the other side. Posted August 20th, 2014 at 8:39 pm | Log in to reply. Fantastic! I know exactly which foldable grills you mean :D I’m going to try this soon. Thank you!! Posted August 20th, 2014 at 10:42 am | Log in to reply. Posted August 19th, 2014 at 9:21 pm | Log in to reply. This recipe was originally posted on August 19, 2014 at 8:47 pm by Maangchi. It was last updated on June 23, 2017. The video was watched 590,412 times on YouTube & has 9,151 likes!